There is an urgent matter requiring your attention and immediate action today. More urgent than this editor's belated opinion of the recent AANF elections, the European Invasion of the Assyrian Convention in San Jose, and the whereabouts of the leader of the ChaldoAssyrians in Iraq. We'll come back to those important issues later this week. Today, I urge you to read this editorial and act at once with a strong resolve to change the course of history in Iraq. Assyrians in Iraq (including those of Chaldean and Syriac faiths) are facing an incomprehensibly persecuting situation in their homeland. Several Chaldean and Syrian churches have been bombed, pariosheners killed, young men beheaded, sisters shot in the head, brothers kidnapped and their bloodied bodies returned the next day to their father. Would any of us have stayed in our hometowns if a group of extremists did all this to our churches and neighbors' children? Assyrians are leaving Iraq. We do not know how many have already or will in the near future. The figures provided so far seem too high. But we know that thousands are stranded in Jordan and Syria, waiting to come to the West. They are penniless and are leaving their homeland not seeking a western lifestyle, rather to escape Islamic extremism. The discussions on helping Assyrians emigrate to the West are pointless. What we must focus on is providing protection for our people in Iraq so that they can return to their homes and farms, and thrive in a newly-formed country pursuing freedom and economic prosperity. This is not a time to argue over whether they should be called Assyrian or ChaldoAssyrian, whether their leaders are in bed with the Kurds or their bishops entertain megalomaniac dreams of a greater church in the Middle East. The Assyrian mother who was told of her son's beheading in Mosul last week cares not for what we call her. She wants her son back in her arms. And the fathers whose children are kidnapped daily in Baghdad and then brutally murdered pay no attention to our demand for a democratic election process. He asked us to help and all we did was wrote editorials and amused one another on Saturday morning television programs. Enough is enough! The safety of our people in Iraq takes precedence over any other topic of discussion or act of charity and support. Today, we must act responsibly as Assyrians, Chaldeans, Syriacs, or whatever name fancies us in our delusional quest for irrelevant mental grandeur. Our people are suffering before our eyes and our silence is killing our children in Iraq. Create a safe haven in the Nineveh Plains. Authorize Congressional funds to rebuild villages, roads, schools, clinics, etc. Allocate funds to resettle refugees. Guarantee registration of ChaldoAssyrians as themselves, and not Arabs or Kurds. This week we need thousands of signatures on a petition, thousands of voices that must speak on behalf of the silenced minority Christians in Iraq, thousands of prayers for the safety of the Assyrian children in Bet-Nahrain. Join the growing army of activists with your voice, your prayer, and your signature. Realize that the safety of our people in Iraq is more important than our overreaction to other social and political issues. Re-read the news sections of today and last Friday's Zinda issues. 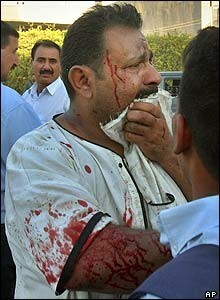 Assyrians are being killed almost every day in Iraq. Sign the Petition (click here) and sign and send the e-Petition immediately (U.S. residents only). Download the Petition (click here) and print copies for every adult member of your household. Sign the Petition and mail it to your Senate or House representative. If you need their names and address, click "Senate" or "House". Call Capitol Switchboard at (202) 225-3121. Ask to speak to the staff member responsible for International Relations or Foreign Relations as well as the office of your U.S. representative. If he/she is not available, voice-mail message like this: Hello, my name is __ your full name___. I am calling to ask Representative ___your rep____ to support the rights of the Christian ChaldoAssyrians (Kaldo-AA-seer-ians) of Iraq, and to help pass appropriations where at least 5% of the funds will specifically help the safety of the Christian population, resettlement of the Christian refugees, and rebuilding of their villages. Also, Please help protect their rights to register as ChaldoAssyrians and not as Arabs or Kurds. Email or fax the petition or the link to this week's issue to as many of your American and Assyrian friends as possible. Organize teams to solicit signatures at your local churches, clubs, even work. 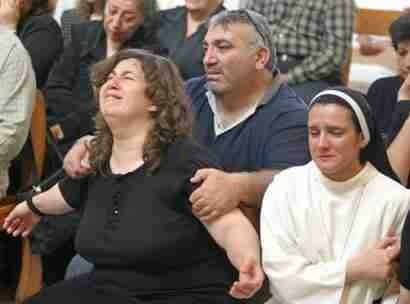 Drop me an Email and let me know how you helped the Assyrians of Iraq TODAY. If you are not living in the U.S. and want to help, please take the text of this petition, alter it to suit your own country's specifications - keeping the 4 Points the same. Zinda Magazine will help disseminate your information to its readers within your country in the coming issues. A safe haven for Assyrian in Iraq, funds to rebuild their villages, to resettle them back into their homes, and to register them as themselves. These simple, but vital demands must be met soon. They will not, unless you act TODAY. Please do. It will only take less than an hour of your time, undoubtedly the most gratifying hour of your life. To the Assyrians in Iraq reading or hearing this editorial today: Your brothers and sisters in the Diaspora will not abandon you in your most difficult hours. We are with you and will do whatever it takes to bring safety, freedom, democracy, and prosperity back to our homeland. The Assyrian nation has overcome more difficult obstacles in the past and shall once again overcome. Since my teenage years I’ve been involved in the Assyrian movement in several ways, mostly through the Assyrian associations. In 2001 I was elected, as the first woman ever, the president of the Assyrian National Federation in Sweden. My lecture today will cover the organization of the Assyrians, as an ethnic group, in Sweden. Today I’ll shortly describe how the Assyrian community has adapted to the Swedish society when it comes to the organization through the non-profit associations. I’ll also talk about gender equality in the Assyrian movement in Sweden. The basis for this lecture comes from my own experiences of the Assyrian movement. The first Assyrians in Sweden arrived in 1967 from the Middle East, mostly from Tur-abdin in Turkey and Qamishly in Syria. These are societies that were, and still are, distinguished for their low standard of living. The Assyrians, however, ended up in an industrialized, high technology and well-developed country. When the Assyrians ended up in the diaspora the differences between their homelands and the new country were big in areas such as politics, culture, social life, and economy. The Assyrians made big efforts in adapting to the new society and system. In several areas the outcome of the transformation was very positive. For instance, many Assyrians founded their own companies and established themselves in the service sector, which increased their prosperity and contributed to a high standard of living for the Assyrians. Another good change that took place was in the political arena. In the Middle East we were oppressed by the governments and as an ethnic group we didn’t have any freedom of speech and the possibilities to work for the sake of our people. In Sweden the Assyrians adapted to the Swedish system and organized themselves within the framework of the Swedish non-profit structure. When the Assyrians came to Sweden they were offered good possibilities to organize themselves and become active in the political work for their people. Sweden has a long tradition of non-profit organizations and working for democracy. Since the times of the peasant societies, the Swedes have had traditions of organizing themselves in the villages. In Sweden the non-profit organization movement already began at the end of the 19th century, with the temperance movement and the Labour Movement. Since then every activity and engagement has been organized by associations and supported by the government. Government contribution is one of the big reasons for the broad non-profit organization movement, since every association and activity is financed by the government, regardless of the size. This is one of the benefits of the Swedish system. The drawback is that the government has had and still has big control and influence over the direction of the activities and programs within the Assyrian movement. The Assyrians are not fully free to do what they want, they must follow many restrictions and laws in order to be able to do what they are doing. This often ends in a big inertia in the work and many are those who loose their participation. This also depends on the Assyrians’ inadequate knowledge of the Swedish language and, and the lack of knowledge of how the Swedish society functions. The young Assyrians who arrived to Sweden were active in the Assyrian Democratic Movement in the homeland. Together they founded the Assyrian National Federation in Sweden (ARS) in 1977. For the first time these young activists could officially call themselves Assyrian. The 1970s are remembered for the activities and eagerness among those many patriots, who for the first time in public could work politically without getting persecuted and oppressed. They saw the possibility of becoming a part of the Assyrian movement and to help their compatriots in the new country. However, because the new environment was so new and foreign the Assyrians stayed closely together in the beginning and organized Assyrian cultural activities. Partly because they were longing for their traditions, partly because they felt outside the Swedish community. During the 1970s and the early 1980s many local associations were founded over the whole country, in cities where many Assyrians lived. These include the better known Assyrian National Federation (1977), the Assyrian Youth Federation (AUF, 1991), the Assyrian Women Federation (1980), the news magazine Hujada (1978) and the soccer team Assyriska FF (1974). Later on a conflict arose between the Assyrians and those who call themselves Arameans, and between the political movement and the church, which shattered the people and destroyed the atmosphere for those who were active. At the same time a new generation of Assyrians grew up in a country that didn’t feel so strange or new any more. On the contrary, Sweden became their new homeland. This generation also became more fastidious in their choices of living conditions, such as education, political engagement and spare time, which resulted in taking an active interest in activities outside the Assyrian movement during the 1990s. This was due to the Assyrian movement’s inability to keep up neither with the development of the Swedish community nor the Assyrian group. The political conflicts within the Assyrian group have also been a cause for the confusion in the cultural and national identity for the new generation of Assyrians in Sweden. Not knowing who you are and were you have your roots has made them gradually dropping off from their involvement in the political and the cultural activities, as well as from the church. In general, the work of non-profit organizations has stagnated in Sweden since the 1990s, consequently the same has happened with the Assyrian non-profit organizations. It’s time to think about what steps one should take in order to reach the people and stay in line with the development of the society we live in. It’s important to figure out what touches and concerns the Assyrian group in Sweden, in order to find those idealistic driving forces that will build up an even better organization for the Assyrian movement. In the beginning of the 21st century, at the national level there have been ideas about building up an old people’s home, a high school and a compulsory school. But they are still ideas, no actions have been taken yet, at least not in full scale. At the international level, to obtain the recognition of being an ethnic minority approved by the United Nations (UN). If these projects become reality the Assyrians will take several steps forward in order to bring the group together and develop it. I’ll now quit talking about the general organization and will end my lecture by discussing what I want to talk about, which is the equality between the genders in the Assyrian movement. It’s always an honor to be a pioneer within a field; during 2001-2002 I became the first female president in the Assyrian National Federation in Sweden. My ambitions were to open the door to more female presidents. It took 25 years for the ANF in Sweden, with its 28 local associations and 8500 members, to produce a female president. However there is still a lot to work within the field of equality between genders, among others the unequal distribution in terms of gender breakdown in committees of the ANF and its local associations. However, I want to emphasize that ANF in Sweden was the second ethnic federation in Sweden to achieve this goal and that more federations should take after. This small success is always the first important step and in the right direction regarding the perspective of the equality between the sexes. However, the being on the commission to lead the ANF in Sweden was not an easy task. Receiving proposals (good ones indeed) from a woman can appear difficult for some men. For me, it wasn’t easy to handle this new situation in which I ended up, since my experiences from my job and family were totally different in perspective of open mindedness and gender equality. Due to my experience, the acceptance of a woman’s work was related to limited and narrow mind, which lead to prejudices about women, especially in leading positions. Today, we are in big need of every nationalist no matter gender, and therefore we cannot afford to exclude anyone right now! There is a fear of exceeding the boundaries between the genders, and it’s obvious that this fear is deeply settled in the Assyrian culture. It’s somewhat sad, as this fear counteracts and prevents the understanding and tolerance between the sexes. What is even more sad is that it’s reducing the intelligence of the Assyrian movement, especially when we consider the small population of the Assyrian people and those who really are active. The human being (not only the men like Aristotle once claimed) is equipped with the ability to think logical and with that we shouldn’t become hypnotized by what is a male or a female person. Every individual, no matter the gender, should have the possibility and the right to make one’s dream come through. Today, one of the big dream for many girls and women are to take an active role in the Assyrian movement. However, the society that we live in is still pervaded by attitudes from a patriarchal male-dominated society, in which the woman is put in the second place. This is in general in our society, but more obvious in our culture, which is a remnant from the Middle East, especially from the religion of Islam, and its narrow view on the woman as an individual. Hopefully we shall remove this remnant with the help of our modern society we live in today. Today, women have to work two jobs, one is to take care of the household and the children, and the other to within the society. Yet, women don’t have as high status as the men. But how will they be able to do all this at the same time if they don’t receive any support! If women do not receive any support from men, they should support and strengthen each other. The women in the Assyrian culture gather in networks based on social aspects, but I would like to see these networks develop on feminist basis, with the purpose to counteract the imbalance of power between men and women. I hope that the Assyrian Women Federation in Sweden will succeed with this goal, which in longer perspective would liberate the woman and make her more active in the Assyrian movement. Among the younger generation the girls are very active in our organizations. One good example is AUF, where the women are highly involved in all activities. However, even at their board of committee there is an imbalance in the distribution of genders according to the numbers of today (3 women, 6 men). 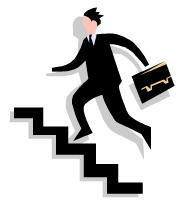 You do not achieve a democratic and equal society without hard work and big efforts. Therefore, until we reach that goal we need to continue the work for increased gender equality in our organizations. The Assyrian Women Federation (AKF) is making big efforts in making change of attitudes and reassessment of different types of norms, which today are big obstacles in the development of the Assyrian women. There are both positive and negative sides of a collective, like the Assyrians are living in. The positive side is that you have a strong social network which gives you support when you are in need. At the same time this network can hinder those who want to go their own ways, ways that reach outside the network. There are many good examples of women and girls from the younger generation of Assyrians who have been able to make a positive balance between their two totally different cultures – the Swedish and the Assyrian. I’m one of those women; in my early 30's, single, financially independent, former president of ARS and PhD student in microbiology. This was never a possibility for my mother and the women of her generation. (ZNDA: Baghdad) Villagers found three decapitated bodies north of Baghdad last Wednesday. Two of the bodies were identified as belonging to two Assyrian youth from Mosul. The two Assyrian victims are identified as Firas Moufaq Putros and Ramon Farouq Shimoun, both from Mosul. A film, released on the Internet, shows the beheading of all three young men. The third victim has not been identified at press time. The victims state their names on the film prior to their beheadings. The bodies were found in nylon bags, the heads in bags alongside them, near Dijiel, about 25 miles north of Baghdad, said Col. Adnan Abdul-Rahman of the Interior Ministry. They were all men with tattoos, including one with the letter 'H' on his arm, but no documents were found on them. A U.S. military official said the bodies appeared to be Iraqis and had their hands tied behind their backs. While insurgents have often beheaded foreign hostages in their fight against the government and coalition forces, it is not a tactic usually used against Iraqis, who are more often abducted for money. Residents from a nearby village found the bodies shortly after dawn and notified the Iraqi national guard, said Iraqi Lt. Ahmad Farouk. An Associated Press photographer saw the three corpses lined up with their heads by their sides on the floor at the guard compound before U.S. troops collected them and handed them over to police. Two wore jeans and shirts and the third wore sweat pants and a T-shirt. All appeared young. The terrorist group claiming responsibility for the beheading calls itself "the Brigades of Salaheddin Al-Eyobe - the Armed Faction’. Salahedin was the Kurdish Moslem military leader who fought Richard the Lionhearted during the Third Crusades and defeated the Christian armies. (ZNDA: Baghdad) When Keis Isitfan headed home from work one recent night, he had reason to watch his back. As a laundry worker for the U.S. embassy inside Baghdad's green zone, he risked being attacked by insurgents targeting Iraqis who work for the U.S. But there was another source of anxiety: Isitfan, 27, is a Christian and, like others of his faith, is facing growing hostility from hard-line Islamic groups who accuse Christians of being sympathetic to the Western occupiers. 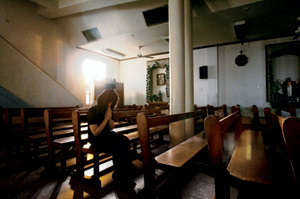 Layla Istifan, 23, prays in her local church days after her brother was killed. She and her family have been repeatedly threatened because of their Christianity. As Isitfan was driving home on Sept. 7, his worst fears came true. After he left the green zone, two cars pulled up alongside, and attackers inside opened fire. Four bullets hit Isitfan, who died on the street. His family, convinced Isitfan was killed for his faith, plans to flee the country. "Christians in Iraq are weak," says his sister Layla, a translator for the U.S. embassy. "All they can do is leave here, like we will do." Between 10,000 and 30,000 of Iraq's 800,000 Christians have fled the country since the fall of Saddam Hussein's regime, according to Christian groups in Baghdad. Although Christians make up only about 3% of Iraq's 25 million people, the U.N. High Commissioner for Refugees has said they account for about 20% of the refugees fleeing Iraq for Syria. They are escaping a climate of violence and a surging Islamic radicalism that have made the practice of their faith a deadly enterprise. The worst moment came on Aug. 1 when Islamic insurgents — most likely connected with terrorist leader Abu Mousab al-Zarqawi, according to Iraqi government officials — attacked five churches in Baghdad and Mosul with car bombs, killing a dozen people. While Muslim authorities in Iraq widely condemned those attacks, local Christians say security has continued to deteriorate. Says Layla Isitfan: "If I can't go to church because I'm scared, if I can't dress how I want, if I can't drink because it's against Islam, what kind of freedom is that?" Like the larger insurgency targeting U.S. troops and the new Iraqi government, the campaign against Christians appears to be becoming more organized. Sa'ad Jusif, a Chaldean-Assyrian Christian, was kidnapped on Sept. 8, according to Dr. Munir Mardirosian, who heads a political party for Armenian Catholics in Baghdad. His captors showed him a list of 200 names, most of them Christian, and demanded to know where they lived. When he refused, he was hung from the ceiling and beaten with iron pipes. He was released only when his family paid a $50,000 ransom on Sept. 13. He left the next day for Jordan. Says Mardirosian: "If they opened the doors to America or Australia, I can say there would not be one Christian left in Iraq." The violence in Iraq threatens one of the world's oldest Christian communities, dating back 2,000 years. The population includes Chaldean Assyrians (Eastern-rite Catholics who recognize the Pope's authority); Assyrians, who form an independent church; Syrian Catholics; and Armenian Catholics. Under Saddam, Christians coexisted more or less amicably with the Muslim majority. Easter services were broadcast on state television, and Christians were allowed to own and operate liquor stores. Christians today keep a low profile. While most of the anti-Christian violence has been committed by a small group of Islamic extremists, Christians say they are encountering rising anger among their Muslim neighbors. Layla Isitfan says taxi drivers have insulted her when they realized she was Christian, in some cases saying all Christians should be shot and killed. At work, she wears a Muslim head scarf and tells colleagues that she is Muslim. Raja Elias, a Syrian Catholic in Baghdad, says that recently a neighbor began to dump garbage on her front porch. When Elias complained, the neighbor said, "You are a Christian, and I can put it inside your house if I want to." With so many other problems to contend with, the new Iraqi government hasn't done much to protect Christians. Businesses traditionally owned by Christians, such as liquor stores and beauty salons, have been regularly vandalized by Islamic fundamentalists who some suspect may be loyal to Shi'ite cleric Muqtada al-Sadr. Elias, who ran a dental clinic in central Baghdad before the war, recently asked the Health Ministry to reopen it. But she was told to work in Sadr City, the seething Shi'ite slum dominated by al-Sadr's men. So her clinic remains shuttered. "I think they will come for me sooner or later," she says. For Iraqis like Elias, the best option is to leave. Many Iraqi Christians say their reversal of fortune has been especially disappointing given the backing the Bush Administration receives from evangelical Christians. "Why did the U.S. come here?" asks Mardirosian, the Armenian-Catholic leader. "To protect the Christians or allow others to kill them?" (ZNDA: Baghdad) When Saadoon Isa's son was released by kidnappers earlier this year after a ransom was paid, the criminals sent the boy's father a message: "Tell him to leave the country because Iraq is not his, it is ours." "I still don't know who they were," says Mr. Isa, the vice president of Baghdad's Al-Nahrain University. "But I took that message to be directed to Iraq's educated people, its professors, business leaders, even the people working hard in our ministries. They want us to leave." With stories like Isa's multiplying, more of the very Iraqis needed to rebuild the country are heeding the pressures to flee. Iraqis speak worriedly of a brain drain that is denying Iraq a part of the educated, moderate, and entrepreneurial population required to move forward. It's a reversal, in the 18 months since the war, of the euphoria that brought thousands of exiles back for the opportunity to build a new Iraq. Many of those Iraqis are still here, building political and business careers. The new interim government is dominated by returnees, and former exiles are expected to fare well in planned January elections. • Every day long lines of Iraqis form outside passport offices. Officials say they have issued more than 500,000 passports since sovereignty was restored in June. Many applicants say the passport is a kind of insurance policy against deepening chaos. • More than 40,000 Assyrian and other Iraqi Christians are estimated to have fled since war's end, hastened by a series of church bombings this summer. The outflow weakens a prominent minority that has been a modernizing and tempering force in Iraq for centuries. • More than 200 university professors have been either killed or kidnapped, according to academic organizations, prompting as many as 2,000 of Iraq's best educators to leave - and many more to consider posts abroad. "Already the economic conditions for our professors was not good, so when you add a security situation that threatens them and their families, many of them will seek to go elsewhere," says Isa. "It's a drain that already existed [after the Gulf war] but now it has accelerated," he says. "Before the economic factor was first, but now things have changed and security is the top worry motivating people to seek a post out of Iraq." An economy that has failed to take off - restrained by stalled reconstruction work, which in turn is inhibited by lack of security - is also a factor. Exiled business people who returned with high hopes are at least keeping their foreign options open. "In this situation about the only thing growing is what we call the Jordan connection," says Yaghthan Hasan, a Baghdad importer of furniture and other goods. "More people with the means are going to Amman to set up businesses," he adds, noting he regularly makes the commute himself. The lines at passport offices tell the story of average Iraqis who are looking to benefit from a new right - passports and foreign travel were available only to a privileged echelon under Saddam Hussein. But among the applicants every day are people contemplating life somewhere else. "They talk about the new Iraq, but that makes me laugh unless you want to talk about the 'new' being unsafe streets and car bombs going off," says Tharwat Saadi, a Baghdad barber who plans to buy a barbershop in Syria and move there. "You can't make a living in these conditions." Government officials acknowledge that families are leaving - in some cases wives and children are going abroad while fathers remain to work - but they deny it has reached alarming levels. One official who does speak in terms of an exodus, however, is Ibtisam Gorges, a Christian member of Iraq's new interim parliament. Since the war, about 5 percent of a 900,000-strong Christian community has left, she says. "There are 3 million [Iraqi Christians] living outside the country, and most of them want very much to return," says Ms. Gorges. "But with the kinds of things that are happening to our people here, it's not possible." She says that after a focus on Christian males, it is now "our daughters" who are being kidnapped. "We are treated like we are part of the American presence here. It's a big pressure on our families, something more of them are deciding to escape." The security crisis is only the latest challenge to Iraq's university system, once considered among the best in the Arab world. Salaries have fallen well below those at universities in the region, which saps the will to stay and fight against the obscure anti-intellectual forces. "The brainpower of the country is leaving, it happened after 1990 and it's happening again now," says Isam Kadhem al-Rawi, a geologist and president of the Association of University Teachers. The organization estimates that 2,000 professors have left since the war, joining the 10,000 the association says left in the 12 years after the Gulf war. Perhaps most unsettling, Mr. Rawi says, is that no one knows for sure who is targeting Iraq's elites, or why. Universities have received warnings via the Internet - either anonymously or from unknown groups - to separate male and female students, or to stop teaching Western ideals. "We don't know who is threatening us, but we do know that when we report killings and kidnappings those responsible are never found," he says. That feeds rumors, he adds - including one seemingly bizarre but widely accepted theory that the US and Israel are encouraging Iraq's instability and brain drain because, as Rawi says, "they want a weak Iraq." Still, some Iraqis are growing impatient with all the attention being paid to those leaving the country, when it is those staying here, including among the elites, whom they say will give Iraq a shot at solving its crisis. "I have the same worries as everyone, but you can't run away and at the same time help build a prosperous and democratic Iraq," says Abbas Abu Altimen, president of the Baghdad Economic Research Center. A business management expert who returned to Iraq after the war, Mr. Altimen says it's time for Iraqis like him to put their knowledge to work at home. Not that he doesn't know what's causing people to do otherwise, he says. "A very good friend's son was kidnapped, they paid $20,000 to get him back - and then they promptly fled to Amman," he says. "But they will be back, just as others will, because this is a unique opportunity to focus on the positive changes and build something new." (ZNDA: Moscow) On 12 September, the St. Mary's Assyrian Church of the East “Mart Mariam” in Moscow and the Assyrian Association of Moscow “Khayadta”, the Assyrian radio program “Qala Aturaya” and the Assyrian Youth Organization “Laimuta” in Moscow collected donations for the victims of the 1 September school killings in Beslan, Russia. More than 300 people were killed when the Chechen extremist took over 1,200 students and their parents and teachers hostage on the first day of school in Russia. Among the terrorists were a few Arabs. The Assyrians of Moscow, disturbed by the events, openly condemned the crimes committed by the terrorists against humanity and Russia. Assembled at the St. Mary's Church, they also remembered in their prayers the victims of the church bombings in Baghdad and Mosul on 1 August. The Assyrians who had gathered in the Church on Sunday morning collected 38,170 rubles or nearly 1,300 U.S. dollars for the victims' families. This amount was sent to the “Fund for the Victims of Beslan”. (ZNDA: Kerala) Patriarch of the Antioch and all the East, His Holiness Moran Mor Ignatius Zakka-I Iwas, arrived in India on Monday on a seven-day visit to the Kerala region. Amid high security, thousands of devotees thronged the Kochi international airport to accord a tumultuous welcome to the supreme head of the Universal Syrian Orthodox Church. Fisheries Minister Dominic Presentation received the visiting dignitary on behalf of the state government. Catholicos Baselious Thomas I and other bishops of the Jacobite Syrian Church received their religious head. Synod secretary Mor Gregorius Joseph, Patriarchal Assistant to Malankara Mor Julius Kuriakose, Mor Philoxenos Yuhanon, Mor Thimotheos Thomas, Mor Ivanios Mathews, Mor Theophilos Kuriakose, Mor Miltheos Yuhanon, Mor Polycarpus Geevarghese, Mor Athanasius Geevarghese, Mor Dioscorus Kuriakose, Mor Dionysius Geevarghese, Church trusty George Mathew Theketalackal, secretary Thambu George Thukalan,Kozhiparambathu Aliyas Ramban were came to receive H.H. Member of Parliament Lonappan Nambadan, Member of Legislatives, T.M. Jacob, K. Babu, P.G Joy, T.H Mustafa, Saju Paul, M.A Chandrasekharan, V.J Paulose, U.D.F convener P.P. Thankachan, other public dignitaries were also came to receive His Holiness. Though tired after a long journey, His Holiness Zakka greeted the people at the airport and extended blessings to the people of Kerala. The Patriarch arrived by an Emirates flight EK- 350 from Damascus via Dubai to attend a host of religious and public functions during his third visit to the Malankara Church. H.H is accompanied by 12 member delegation, including Mor Athanatius Elia Bahi (Patriarchal Assistant), Pathros Mor Silvanos (Homs), Malki Mor Militius (Australia). He will be accorded a public reception at Ernakulam today marking the beginning of year-long silver jubilee celebrations of his enthronement as the 122nd successor to St. Peter. The Patriarch, later, proceeded to Le-Meridian hotel in Ernakulam. Tight security had been thrown in and around the airport in view of the prolonged dispute between the two factions of the Church and the strong reservation of rival faction to the visit of the Patriarch and his proposed visits to some of the disputed churches in Kerala. (ZNDA: Kerala) All arrangements are completed for the Jacobite Episcopal synod meeting on 23 September at Karingachira St. George Jacobite Syrian Orthodox Church, which will be presided by the visiting Patriarch H.H. Ignatius Zakka I Iwas. 18 Bishops, including 3 visiting Bishops from Syria, Mor Athanatius Elia Bahi (Patriarchal Assistant), Pathros Mor Silvanos (Homs), Malki Mor Militius (Australia) will take part in the historical synod meeting. The synod will decide on various spiritual and administrative issues. 30,000 people, through closed circuit TVs arranged, can view the Patriarch's Holy Qurbana and other services in the Church. "The Patriarchal visit and the Episcopal Synod at Karingachira are historical ones", said Catholicos H.B. Baselius Thomas I, in a press conference. "The Malankara Association meeting at Mulanthuruthy Church on 27th September will be the repetition of such an Association meeting held 126 years ago", the Catholicos added. "The Patriarchal visit is coinciding with the historical changes happened in the Malankara Jacobite Syrian Orthodox Church and hence the Episcopal synod convening at Karingachira, after the formation of the new Malankara Jacobite Syrian Christian Association, will have several implications", said the Episcopal Synod Secretary H. G. Joseph Mor Gregorios. The Patriarch will attend the silver jubilee celebration of the Patriarchal consecration on 21st at Ernakulam Marine Drive. The Chief Minister Oommen Chandy will inaugurate the meeting and the keynote address will be given by Major Archbishop Mor Varkey Vithayathil. On 23rd at Karingachira Church, the Catholicos H.B. Baselius Thomas I, Kochi Diocesan Bishop Joseph Mor Gregorius, other Bishops, Priests and lay leaders will receive the Patriarch. After the morning prayers and Holy Qurbana, the Patriarch will give the key message to the people attending the service. After completing the visit in Kerala, the Patriarch will leave for Delhi on 28th. His Holiness will be given public reception there under the leadership of National Christian Council of India. The Patriarch will meet the President of India, the Prime Minister, Congress President Sonia Gandhi and the Opposition leader. BACKGROUND: Since 2002, nearly a year before the toppling of Saddam Hussein, the Christian community of ChaldoAssyrians in Iraq (also known as Assyrians, Chaldeans, and Syriacs) has been under threat, due largely to its non-Muslim status. Beheadings, kidnappings, and assassinations have escalated in proportion to how vocal the large Diaspora community became in support of its long persecuted people. 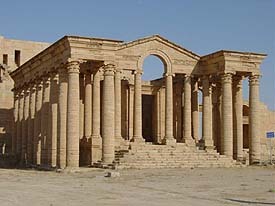 On 1 August 2004 the attacks on Christians culminated in the bombing of five churches in Mosul and Baghdad during worship services, and several people including children were killed in the ChaldoAssyrian town of Baghdeda on the Nineveh Plains, on 10 September 2004 when a residential area became the target of insurgents’ mortar attacks. The Iraqi government's security apparatus is unable to prevent intimidation and killings perpetrated against the ChaldoAssyrians in Iraq. Furthermore, the Iraqi Government makes no attempt to acknowledge, investigate, or punish officials in the North and in and around Baghdad and Mosul where a greater concentration of the ChaldoAssyrians live. Widespread and systematic abuse of human rights and targeted killings of Christians continue every day in Iraq, mainly in the Kurdish-controlled areas in the North, Mosul and Baghdad. As a result of such atrocities, some 40,000 ChaldoAssyrians have already fled Iraq since July of this year. Iraq, once the center of the earliest Christian Churches in the world, may soon be cleared of its ChaldoAssyrian population, the only indigenous people of that country – the ancient Mesopotamia. A safe haven, the administrative region guaranteed in Iraq’s Transitional Administrative Law: Article 53D, which would include the villages located near Mosul, in the Nineveh Plains. Congressionally authorized funds to rebuild their destroyed villages, roads, schools, and clinics and economic development. To know that the greatest democracy in the world, the United States, stands with them and help them in registering as ChaldoAssyrians, and not Arabs or Kurds. ACTION NEEDED: September and October are the busiest legislative months of the year, and represents our best opportunity to pass legislation to help ChaldoAssyrians. If legislation is not passed within the next few weeks, there may NOT be an opportunity to act for another year, when exodus may have proceeded beyond reversal. Christian Iraqis will soon follow the path of Iraqi Jews, unless Christian Iraqis are willing and able to defend themselves. I see no Christian Iraqi group actively arming or seeking support for arms. Christian Iraqis shouldn't be foolish enough to believe US forces will protect them. Praying and hoping are one thing, fighting with arms is another. If Christian Iraqis want peace, respect, dignity and life in Iraq they must be willing to take up arms and fight for their freedom. Strategic Entertainment and Assyrians Around the World are proud to announce the release of their 2nd Assyrian movie. 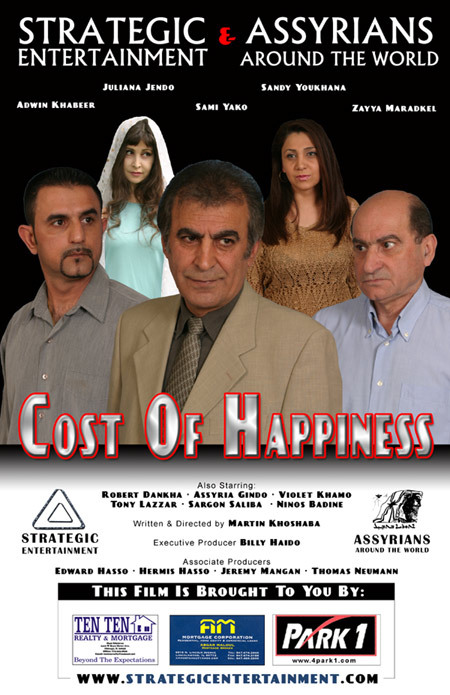 "Cost of Happiness" is a feature-length dramatic film about a young Assyrian man, David (Adwin Khabeer), who is struggling to find happiness in his life. After the loss of his mother (Juliana Jindo), at an early age, David grows up trying to achieve the "American Dream" of prosperity, happiness, and love. While working at a dead end job, David is faced with the challenge of dealing with his unemployed and alcoholic father Showel (Zayya Maradkel). To ease his troubles, David develops an obsession with making money quickly and at any cost. He meets local entrepreneur and community outcast, Freydon (Sami Yako), who offers David a chance to become wealthier than he could ever imagine. In spite of all of David’s personal dilemmas, he continues to be an active member of his youth organization. He adopts a new task for his youth group, her name is Ator (Assyria Jendo), a young girl that is stricken with cancer and needs help. David persuades the members to pool money for the ailing child. David's life reaches a turning point filled with critical decisions that involve alcoholism, deception, and his morality. This is when David must decide: what is the Cost of Happiness? The first time I became a refugee, I was 19, and I became a refugee inside my own country. I was born in Fishkhabour, in northern Iraq. There were about 200 Christian families in the village, and we were farmers. In August 1975, the government issued an order to remove us from our homes. Suddenly the police were there with their trucks, and they told us that we had a few hours to pack. Many villages around us were emptied as well. It had been a Christian region, and the removals were an effort to Islamize the area. Saddam Hussein was the real ruler at this time, although he was officially only the vice president. We believe that he gave the order. We had cousins in Baghdad, so we went there. Eventually I opened a liquor shop, and later some billiard halls with slot machines. Billiards is the second most popular game in Iraq, after soccer. Under U.N. sanctions, Iraqis weren't allowed to enter international competitions. Iraq's best players played on my billiard tables. Business was good, yet I still hoped to return to Fishkhabour. The American invasion was our greatest hope. We had been planning for it, thinking that we would be able to return to our villages. But gangs formed everywhere, and Christians were easy targets because they don't belong to a tribal system like other Iraqis. We were subject to looting and to threats. Then my nephew Patrous was kidnapped in the summer of 2003. We had to pay $15,000 and some gold to ransom him. We were successful businessmen, my brothers and I, but this was a fortune for us. In Iraq, it would take us more than five years to earn that much again. Patrous was held for four days. The kidnappers didn't harm him physically, but he was only 8. He was terrified. And he's still very fearful; he never leaves his parents. Sometimes he shouts the name of his kidnapper -- Adnan -- in his sleep. This January, another gang tried to kidnap my son. He was by the gate of our home, returning from school. Suddenly a car pulled up, and the men inside grabbed him. But my son, Gorgis, is 11, and he's smart. He slipped away, leaving only his shirt in their hands. We believed that Iraq would be better after Saddam Hussein. But only Saddam had the power to control these gangs. I also have three daughters. Nahrain is 15, Narmeen is 14 and the youngest, Nuhra, is 9. The day my son escaped from his kidnappers was the last day any of my children went to school. After that, I couldn't allow them. It wasn't safe. Kids have so much excess energy; they need to run. It's damaging to curb this energy, but I had no choice. The children lost their appetites, and they became so depressed that the youngest even stopped watching cartoons. They were afraid that the gangs would attack the house or attack me. The older girls spent a lot of time on the phone with their friends, so they knew other families in our neighborhood who had been attacked. My wife and I suffered terribly, seeing the children in this state. In our home in Baghdad, we had a separate bedroom for them, but they only wanted to sleep with my wife and me during this time. They didn't want to be alone. None of us did. When I decided to keep the children home from school, I went to talk to their headmistress. She told me that many families were doing the same thing in the face of the kidnappings. She didn't try to insist that the children stay in school. She understood how dangerous life had become. Our two teenagers kept asking me what kind of future they would have if they couldn't go back to school. I felt so helpless. At first, we thought of teaching the children at home. But there was no way we could sit them down and teach them -- all our minds were consumed by our fears. Christians are one of the oldest peoples from my region, and we have served our homeland in many ways. But we couldn't remain. In May, we took a taxi to Damascus. It's a 10-hour drive. There are so many Iraqi refugees in Syria now. In the street, we even bump into people we knew in Baghdad. There is security, and we aren't subject to any harassment here. My daughter Nuhra plays outside all day. Everyone she meets is a new friend. Children don't ask whether you're Iraqi or Syrian; they only look to see if the other child is friendly. But we're allowed only five months as refugees, so there's no chance for us to make this our home. Our stay is almost over. We hope to get visas to Australia. Many Iraqi refugees are seeking asylum there. I tell the children that in Australia everyone has his own computer. I tell them that they would be well educated. But the children are very frightened. They're young, but they follow the news. They don't want to return to Iraq. There's no way I can reassure them that we may not have to return. I can't give them too much hope, because I can't predict what will happen. In the southern Iraq desert, the standing structures of ancient archaeological cities dot the horizon - majestic monuments to times long gone. Untouched for thousands of years, historic temples, palaces, tombs and entire dead cities are the sole witness of the passing of time. Properly excavated, these cities could reveal valuable knowledge on the development of the human race and resolve the big mysteries of history. Unfortunately, this is unlikely to happen. The Sumerian cities have been destroyed, ravaged by the incessant looting that started with the American invasion of Iraq. Once considered historical treasures, today crater-filled landscapes compete for space with hills of shredded pottery and broken bricks. Looters - mainly farmers or jobless Iraqis of all ages - have destroyed the monuments of their own ancestors, erasing their own history in their tireless search for artifacts. They leave their homes and villages seeking financial rewards. Poverty, ignorance and greed force them to change their lives and become tomb raiders - and they actually live on the sites they are robbing for months at a time. A cylinder seal, a sculpture or a cuneiform tablet can bring in desperately sought hard cash. They work all day long hoping to find an artifact that they can sell to the dealer for a mere few dollars. It is tough, dangerous work for bad pay. "A cylinder seal or a cuneiform tablet brings in under $50 on the site for the looter from the dealer. The dealer then sells it at ten times the price," explains the archaeologist responsible for the district of Nasiriya, Abdul Amir Hamadani. "More than 100 Sumerian cities have been destroyed by the looters since the beginning of the war," says Hamadani, who was appointed at the war's end by the State Board of Antiquities and Heritage in Iraq. "It's a disaster that all we are keeping watch on but about which we can do little. We are incapable of stopping the looting. We are five archaeologists, some hundred guards and, occasionally, a couple of policemen - and they are a million armed looters, backed by their tribes and the dealers. "We are in danger every time we go on a tour to an archaeological site. A couple of weeks ago, while on site, six vehicles surrounded our cars and we were shot at. After that, we were assured that the next time, we would be killed." If the looters are just simple peasants, the dealers in stolen antiquities are far more sophisticated. Professional smugglers, they are connected to the shadowy ring that is the international antiquities mafia and black market collectors. There's never a shortage of funds since demand for Mesopotamian artifacts is constantly high - private collectors all around the world adore Sumerian artifacts because they go back to the beginning of civilization and in order to possess such items they are ready to pay hundreds of thousands of dollars, all of which intensifies the looting. To cover their backs, local dealers buy the protection of the big clans in the nearby city of Al-Fajr who send their own people to plunder the sites. "The tribes are powerful, they are well armed and above all, they abide by their own laws," explains Donny Georges, the Director of the Iraq's museums and an Iraqi archaeologist of Assyrian origin appointed by the Americans a few months after the looting of the museum. "No one can stop them. 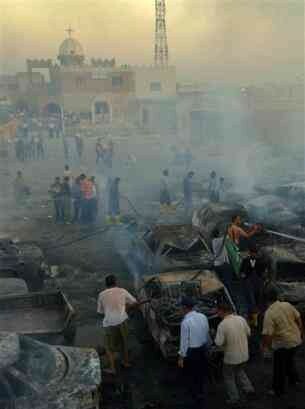 Although the Coalition forces are well aware of what is going on, no real effort is being made to stop the looting. The Italian Carabinieri (soldiers) are the only force that worked on this issue for a few months. Their efforts were fruitful in some parts of the Nasiriya district because the tribe leaders there are never interested in confronting the military." Every military force in Iraq has it's own program of working in the city that they are controlling. Depending on their internal organization some of them work on humanitarian levels, others on protection and others - like the Carabinieri - on archaeology. The Carabinieri unit in charge of heritage protection, known as Viper 5, used military backup on the sites to stop the looting at the beginning of this year. With the help of helicopter flyovers and foot patrol raids on the archaeological sites once or twice a week they were able to capture and imprison many looters, but in doing so also terrorized the local population. The illegal digging stopped as a result - but only for a few months. The recent military conflict between the Al-Mahdi army, the local Shiite militia loyal to firebrand cleric Moqtada Al-Sadr, and the Coalition Forces hit this protection scheme hard. "On one hand, it forced the Viper 5 team to reduce their excursions to the archaeological sites to occasional trips, and on the other it pushed the looters to join the Al-Mahdi army," assures Hamadani. It's no longer a question of looters versus protectors; this is a war with heavy political dimensions. The turn of events caused the Carabinieri to withdraw from a protection assignment. "At the time it was like a pleasant dream sequence in a long nightmare," says Hamadani, "The looters did not join the Al-Mahdi army because they believe in fighting the Occupation, it's more about personal vendetta. Now they were able to intensify their activities. There were no Italian forces at the Nasiriya Museum when the library was set ablaze. The smugglers are now controlling life in this district and nothing is stopping them from looting." "These people have no respect for anything, not even their own religion," claims Georges. 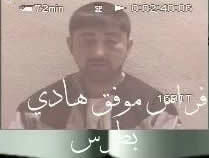 "Last May, they stole the treasures of the Imam Ali in Najaf. No one really knows what was there but it is widely believed that those were the treasures of the Islamic Sultans. People have been donating their most precious objects to the Mausoleum since the birth of Islam. All that is vanished today." According to sources inside and outside Iraq close to the smugglers, the local ringleaders are members of the old regime and are known to archaeologists, police, Interpol, private collectors and antiquities dealers. They work out of Baghdad and other big cities in Iraq; they secure the cash flow to the looters, and are capable of smuggling anything outside the country. There seems to be no end in sight to this horrific scenario. The coalition military forces are now causing irreparable damage themselves: they have transformed the historical city of Babylon in southern Iraq into a military base, despite promises from former U.S. overseer of Iraq Paul Bremer in late June to dismantle the base. "They have leveled archaeological grounds in parts of the site to build a landing zone for helicopters," says Zainab Bahrani, professor of Ancient Near Eastern art history and archaeology at Columbia University, who recently returned to New York City from a six-month observer mission in Iraq having been appointed by the Coalition Forces Senior Advisor for Culture. "The continuous movements of helicopters have caused the destruction of a wall at the temple of Nabu, and the roof of the Temple of Ninmah. Both date back to the sixth century B.C." Bahrani says. The military base at Babylon has still not been removed. According to an archaeologist working with the Americans at the World Heritage site of Hatra, Northern Iraq, who did not want to be named, the danger is no less there than in Babylon. The U.S. Army program to destroy military left overs from the old regime and the war is harming the ancient site - a Parthian city with a blend of Hellenistic, Roman and Arab styles. Twice a day the army conducts controlled explosions of recovered munitions and mines at the nearby military base. The constant seismic activity is damaging the stone arches in the main temple and the outer wall of the city and this may cause the collapse of parts of this site, listed as a World Heritage monument. The anarchy that is everywhere in post-Saddam Iraq is destroying the country described in schoolbooks worldwide as the "cradle of civilization." With over 10,000 archaeological sites still buried, humanity may just be witnessing the destruction of the cradle - the massacre of Mesopotamia. The Assyrian American National Federation (AANF), established in 1933 in the wake of the massacre of Assyrians in north Iraq, has launched an email, telephone and postal campaign to push for Assyrian rights in Iraq (http://www.aina.org/petition.html). Since 2002, nearly a year before the toppling of Saddam Hussein, the Christian Assyrians in Iraq (also known as Chaldeans, and Syriacs) have been under threat, due largely to their non-Muslim status. Beheadings, kidnappings, and assassinations have escalated in proportion to how vocal the large Diaspora community became in support of its long persecuted people. 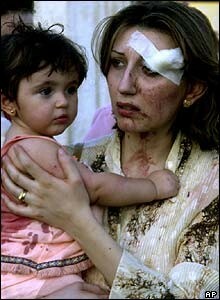 On 1 August 2004 the attacks on Christians culminated in the bombing of six churches in Mosul and Baghdad during worship services, and several people including children were killed in the Assyrian town of Baghdeda on the Nineveh Plains, on 10 September 2004 when a residential area became the target of insurgents? mortar attacks. At this time, the Iraqi government's security apparatus is unable to prevent intimidation and killings perpetrated against the Assyrians in Iraq. Furthermore, the Iraqi Government makes no attempt to acknowledge, investigate, or punish officials in the North and in and around Baghdad and Mosul where a greater concentration of the Assyrians live. Widespread and systematic abuse of human rights and targeted killings of Christians continue every day in Iraq, mainly in the Kurdish-controlled areas in the North, Mosul and Baghdad. As a result of such atrocities, some 40,000 Assyrians have already fled Iraq since July of this year. Iraq, once the center of the earliest Christian Churches in the world, may soon be cleared of its Assyrian population, the only indigenous people of that country -- ancient Mesopotamia. -- A safe haven, the administrative region guaranteed in Iraq?s Transitional Administrative Law: Article 53D, which would include the villages located near Mosul, in the Nineveh Plains. -- Congressionally authorized funds to rebuild their destroyed villages, roads, schools, and clinics and economic development. -- To know that the greatest democracy in the world, the United States, stands with them and help them in registering as Assyrians, and not Arabs or Kurds. For information on this campaign click here and see this week's ZINDA SAYS.